For anyone who has seen the classic film "Out of Africa," it's hard to forget Meryl Streep's recurring line as Karen Blixen: "I had a farm in Africa, at the foot of the Ngong Hills." 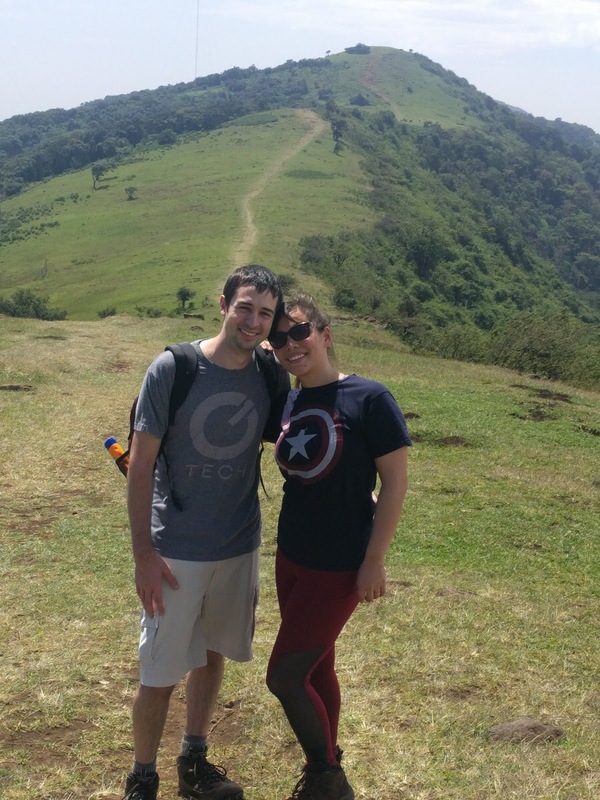 Well, we finally hiked the Ngong Hills - all seven of them (though it seemed like many more than seven)! You can tell the photo above was taken at the beginning of the hike, because neither of us is limping or drenched in sweat or sunburnt. We paid a small entrance fee and then booked a security guard, which is recommended because of the potential threat of both wild animals and thieves. Fortunately, we came across neither, but it was nice to have the peace of mind that came with a guard. 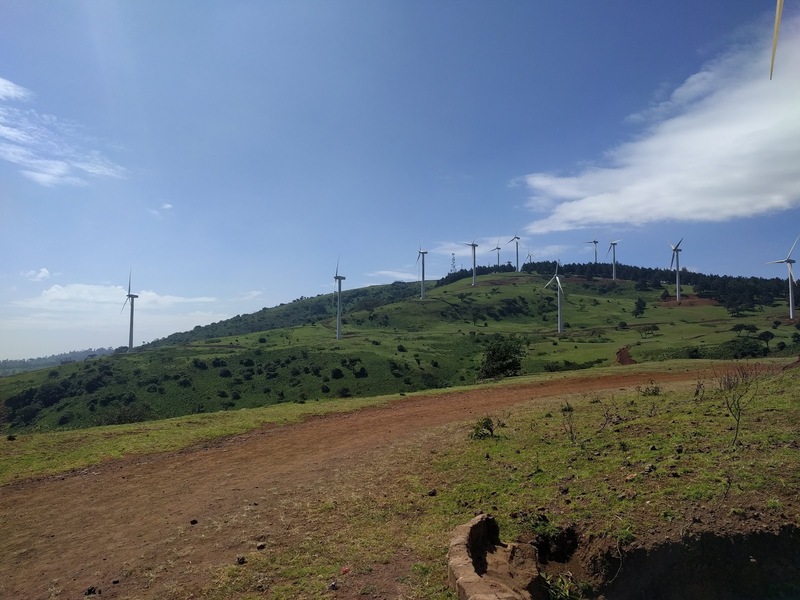 The hills were fairly windy, so it made sense that they had windmills. These are the first I've seen in Kenya. The landscape was generally amazing, especially because it had been raining enough in the preceding weeks for the hills to be beautifully verdant. Seriously, the views made the whole three-hour hike worth it. Even though we went on a Saturday, it wasn't crowded at all, either. We even had plenty of options to choose from for our hilltop picnic. 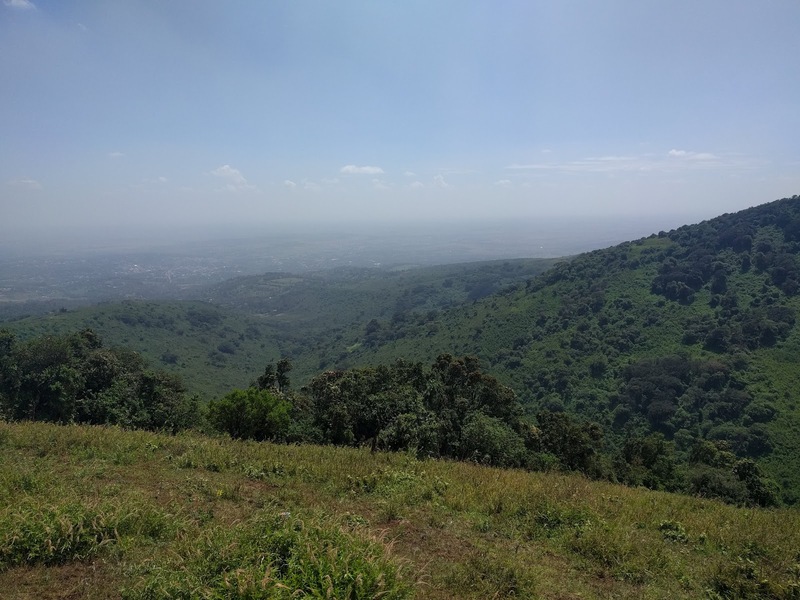 It's easy to see why churchgoers come to the Ngong Hills to worship. 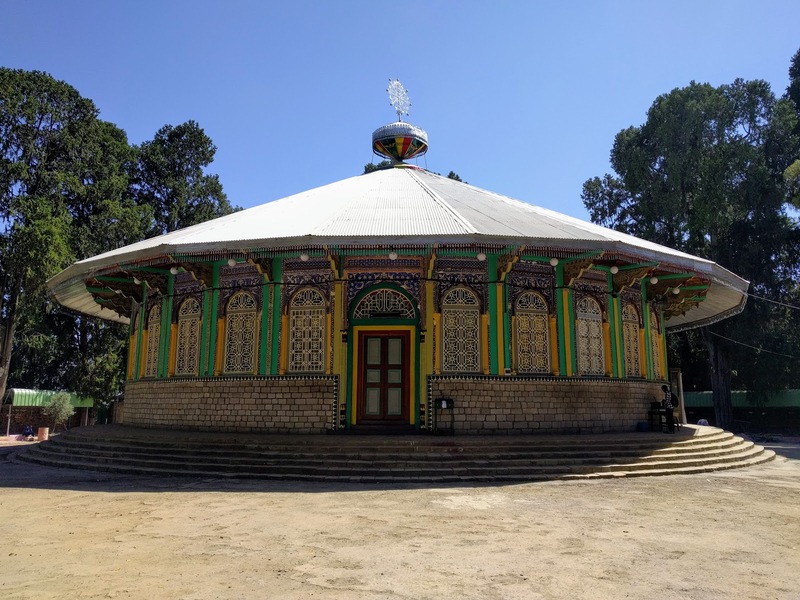 We even saw a group of worshippers beating a large drum, singing praises, reciting scriptures, and dancing their way across the hills together while we were there. What was most impressive was that even older members of the party and those without proper shoes or even some barefoot participants happily joined the hike! I was blown away by their strength and faith. Hiking Ngong Hills was definitely a special experience that I would recommend to anyone in Nairobi who loves nature and a good workout! Thanks to our dear friend R, who made this day out his last request before leaving Kenya. Anyway, we spent a long Christmas weekend in Ethiopia. 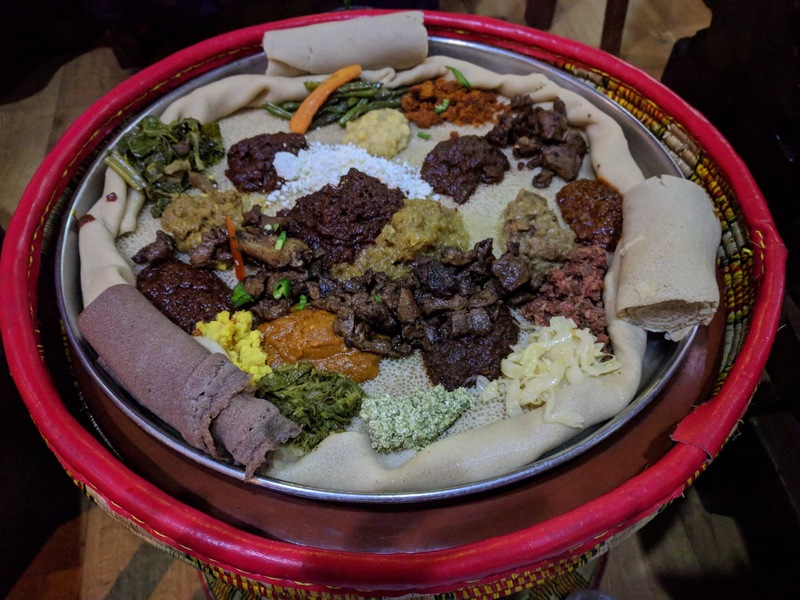 It seemed everyone I know who has been to Ethiopia told me that one weekend is nowhere near enough, and that you need to fly to Axum or Lalibela. 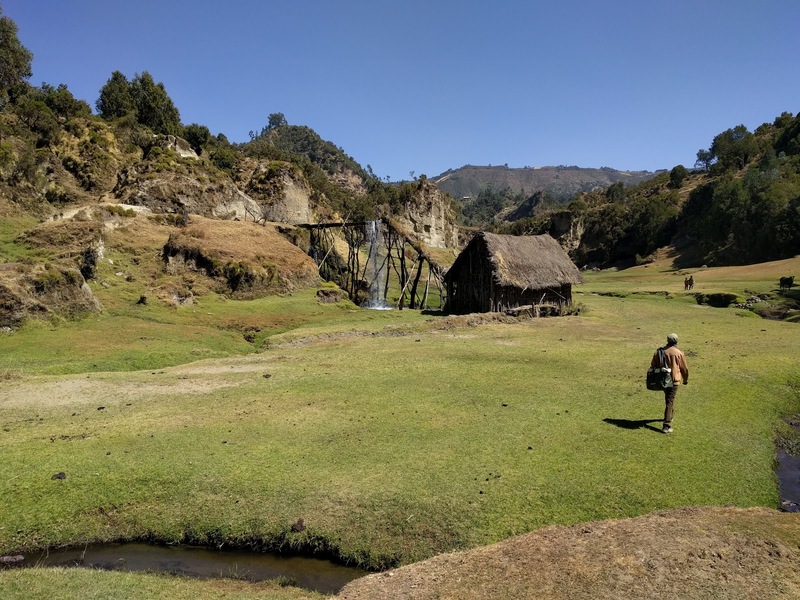 Although it's true that we missed many of Ethiopia's wonders this time around, we still had a chance to experience enough amazing things that I would argue the trip was entirely worth it. The Red Terror Martyrs Museum was a true gem, and it was free. I wish there had been more of an explanation of the historical context, as it seems the exhibits assumed some knowledge of Ethiopian history. 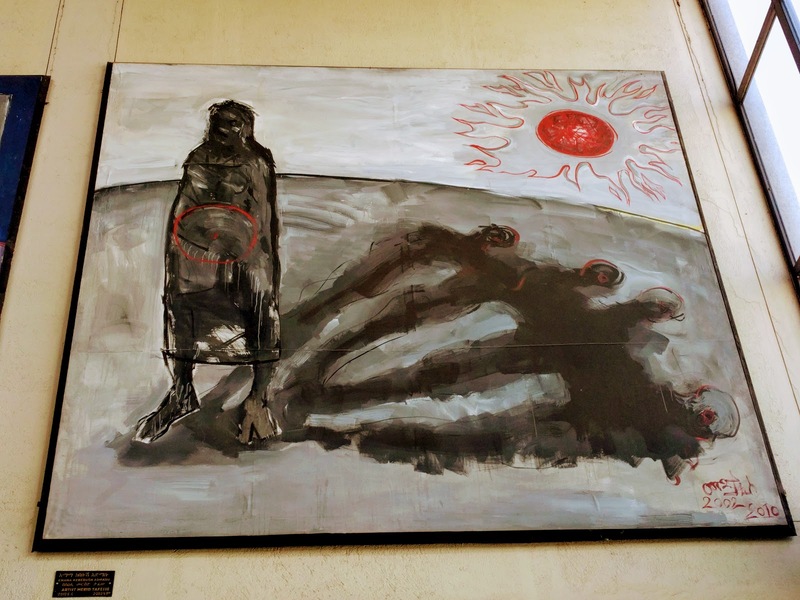 Nevertheless, I found the art depicting the pain and suffering of the Red Terror very moving. For instance, the photo above is of a painting depicting the agony of a mother whose four children were slaughtered in one day. 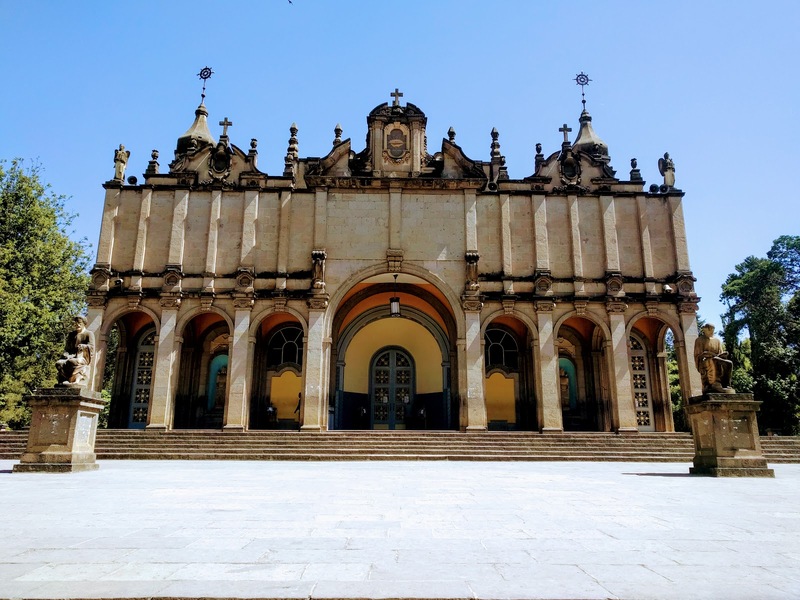 After that, we were off to the Holy Trinity Cathedral, which was a lovely church that looked like it could have dropped out of Europe (above). The contrast was made even more stark by the fact it was right next to another beautiful Ethiopian church in a completely different style (below). We were reminded of that the next day, when we visited the ancient sites Melka Kunture, Adadi Mariam, and Tiya. 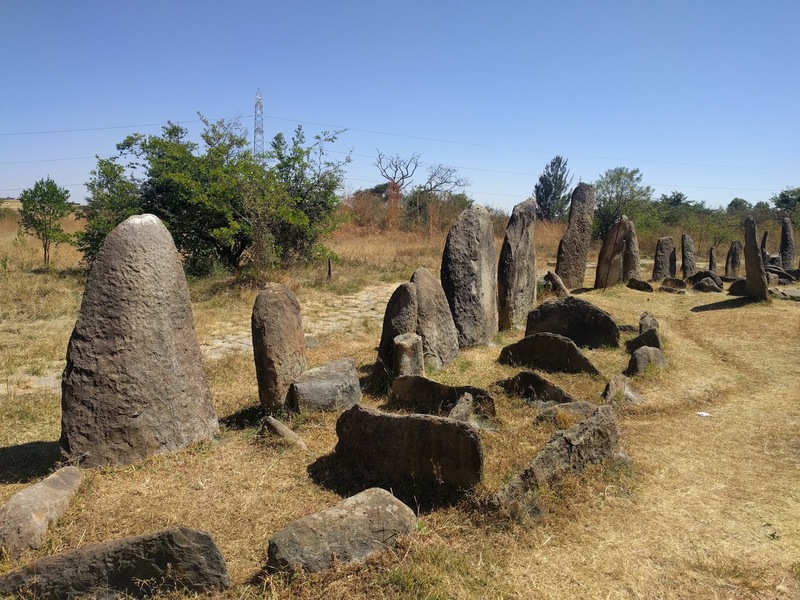 Melka Kunture is an archaeological site with an attached museum sharing some of what we know about human evolution. 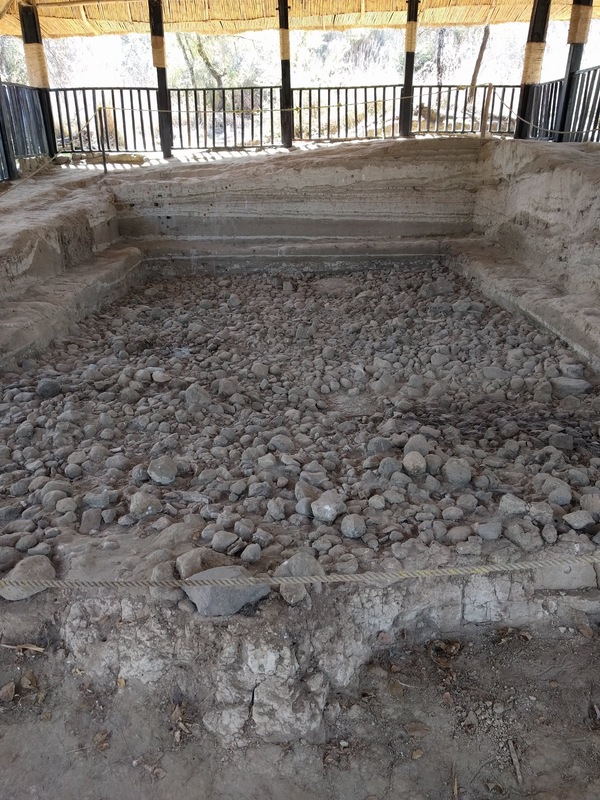 We visited an excavated area (pictured above) that contained remnants of civilization 800,000 years ago! Similarly, Tiya - a UNESCO World Heritage Site - contained ancient grave sites and standing tombstones that tell us a lot about our ancestors. For example, they carved swords on the tombstones to represent the number of enemies the person buried there killed. Also, Christians were buried horizontally west to east (in preparation for resurrection upon the Second Coming of Christ), while Animists were buried upright. 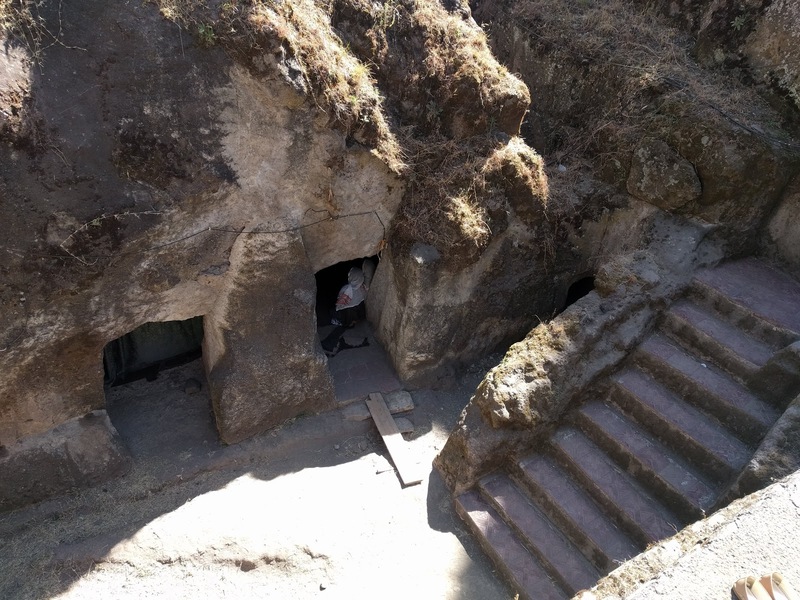 I was especially grateful we were able to see Adadi Mariam, the only one of the famous, Lalibela-style rock-hewn underground churches easily accessible from Addis. From far away, the church itself looked like a grassy hill. Up close, though, it was clear the rock inside the hill had been cut to form the church and stairs leading down into it. 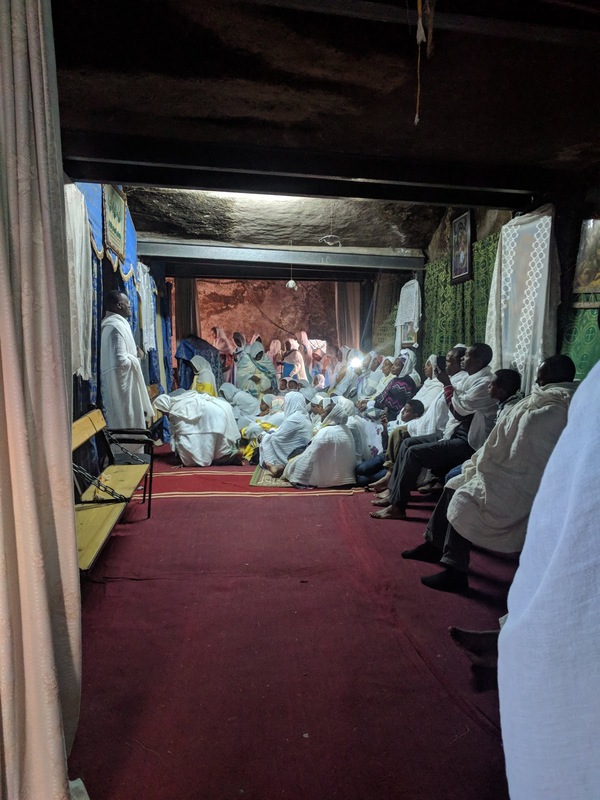 Inside Adadi Mariam, there was a preacher delivering a sermon in Amharic that sounded beautifully musical and many worshippers were gathered there, as we went on a Sunday. We concluded that these sites are a must for history, religion, and science nerds. 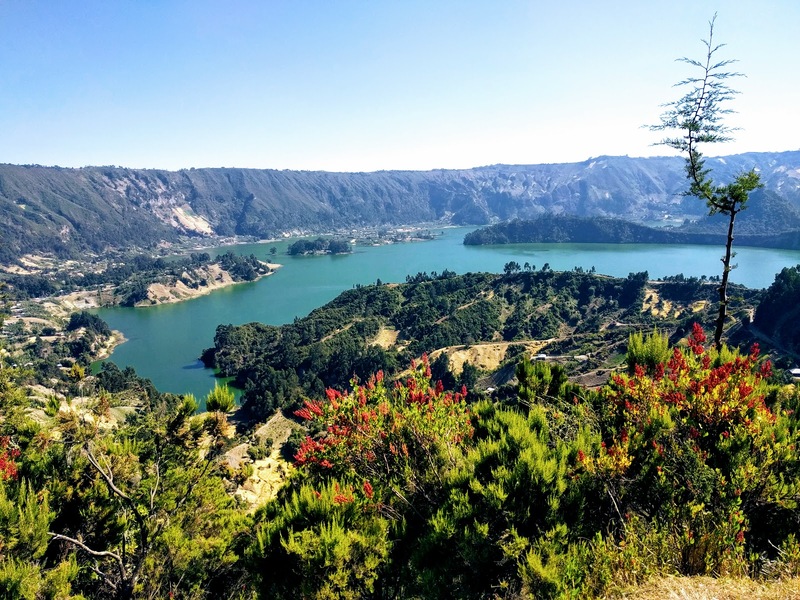 We spent our last full day in Ethiopia taking a day trip to Wenchi Crater Lake, formed in a dormant volcanic crater, which was breathtaking (as you can tell from the first photo of this post)! 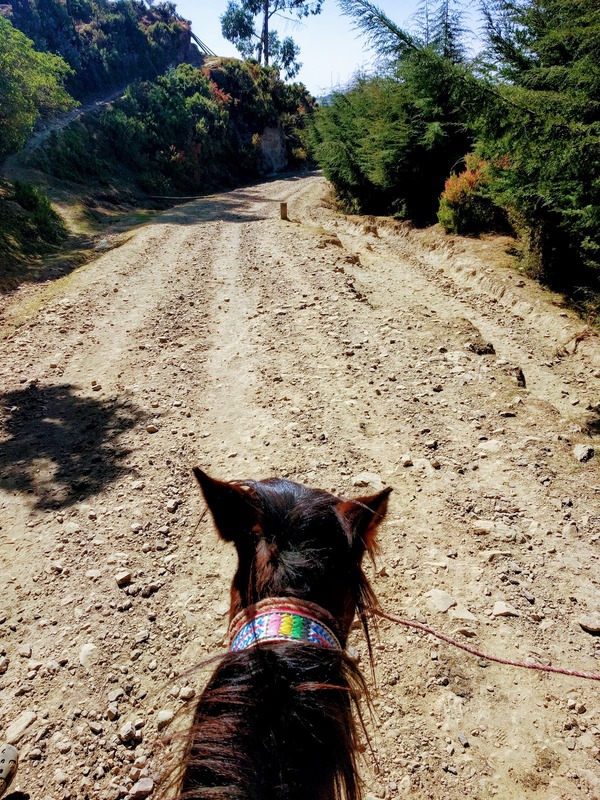 We hiked, rode horses, and took a boat across the lake to an island monastery. We saw all kinds of cool things, including a waterfall, actively bubbling hot springs, a traditional water mill (above), and plenty of wild horses. 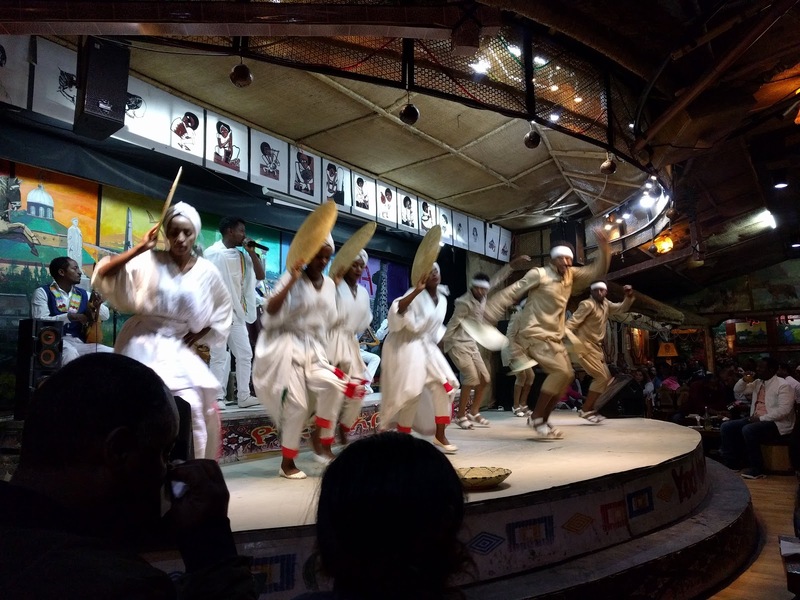 Of course, we also made time for authentic Ethiopian food (and we ate properly with our hands), with a bonus of traditional music and dance performances at Yod Abyssinia. All of the performances were amazing, and it was a full house the entire time we were there. The hours flew by as tourists and locals alike drank, ate, and were merry together. Although it was tough to spend Christmas away from family for the first time, having such a wonderful trip made it at least a little bit better. 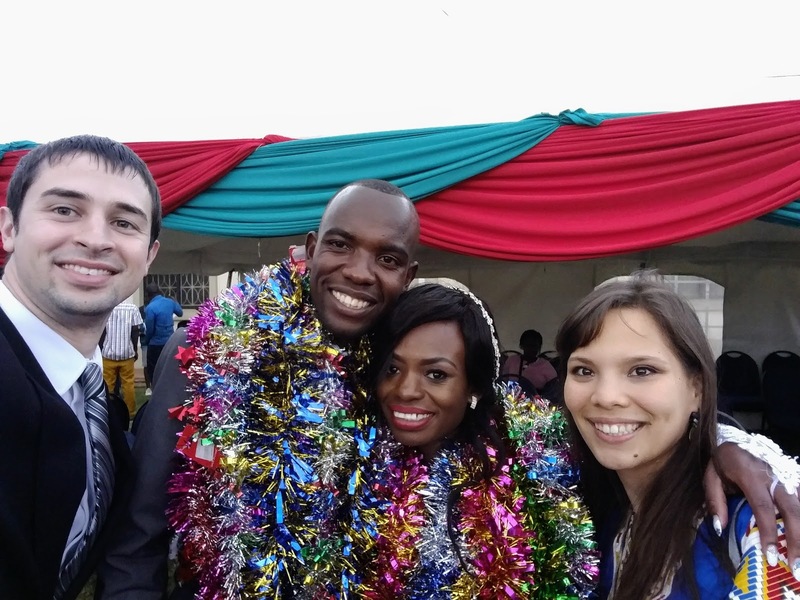 We went to a Kenyan wedding for the first time! A big thanks to M and G for letting us be a part of their special day - just look at what a beautiful and happy couple they are! 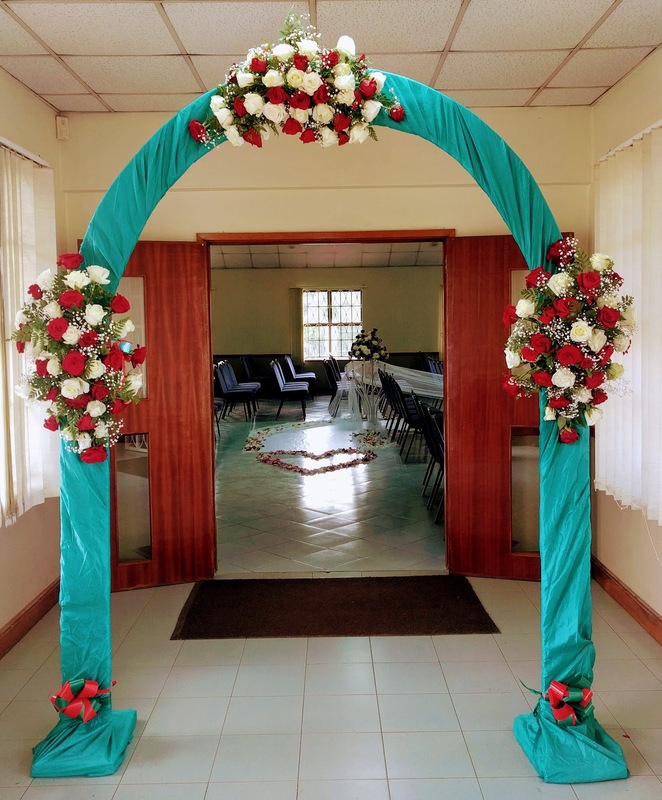 The ceremony itself was like a church meeting in some ways, with prepared talks and hymns. 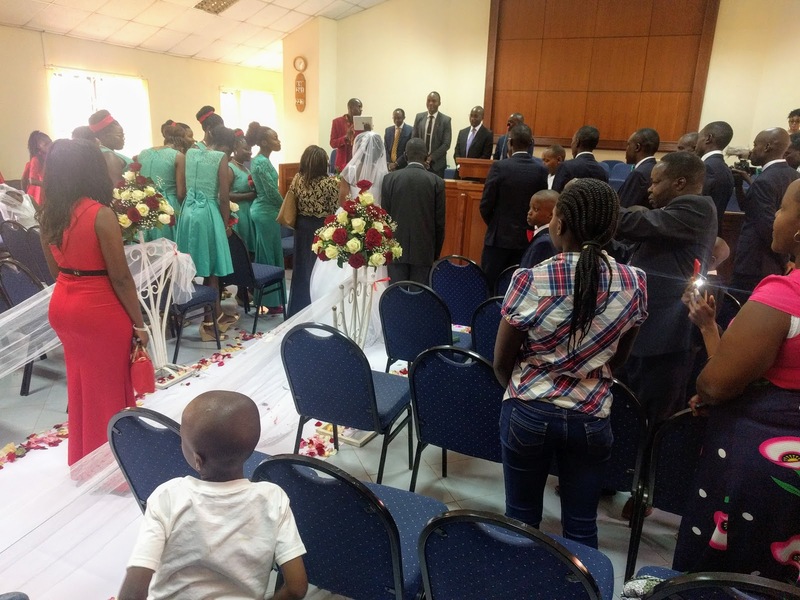 At the same time, the couple made it very special with their own written vows exchanged during a ring ceremony and other personal touches. 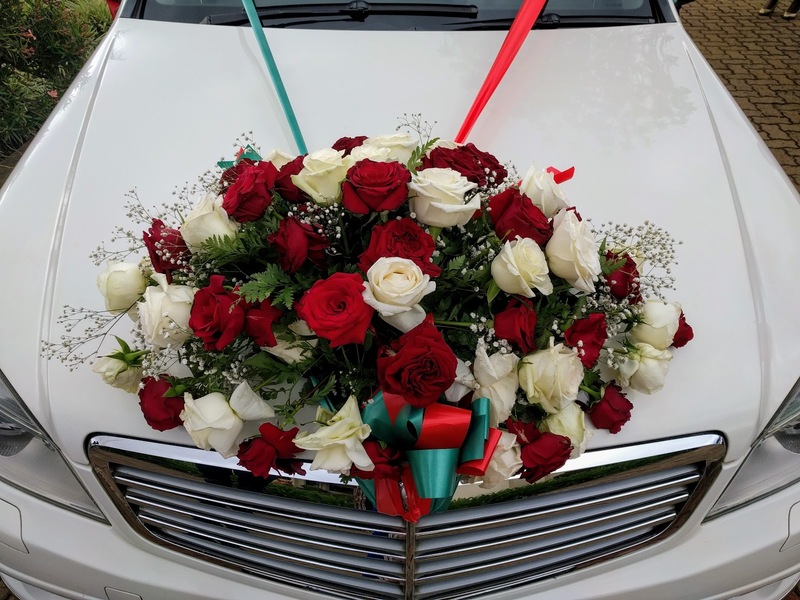 One of the coolest parts about the wedding was the mixture of modern and traditional practices. 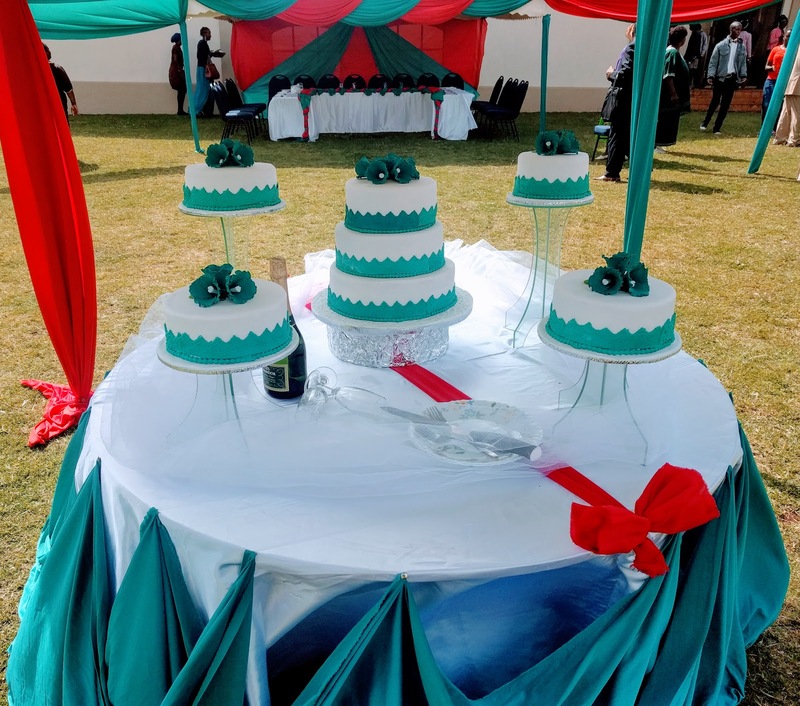 There were many elements that could be found at an American wedding: the white bridal dress, the flower girl, the cake, etc. Yet the couple (and the wedding committee of community members who led wedding planning) incorporated many cultural customs, including traditional dances and music as well as a gift-giving segment where families laid many glitzy leis around the bride's and groom's necks (as pictured in the first photo of this post). 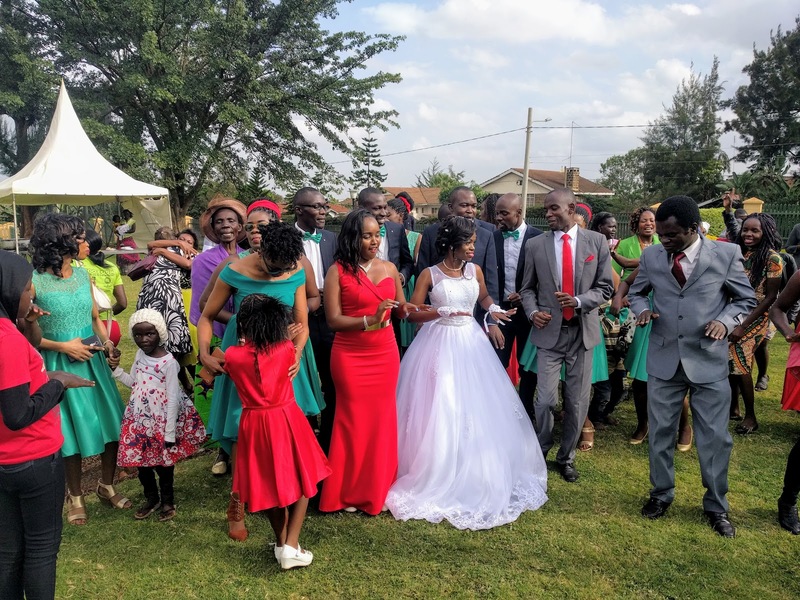 The wedding was definitely one of the best days we've spent in Kenya so far. We're so grateful to call this couple our friends and to have been included in the celebration! Regular readers may have noticed that I haven't written an entry in a few weeks. 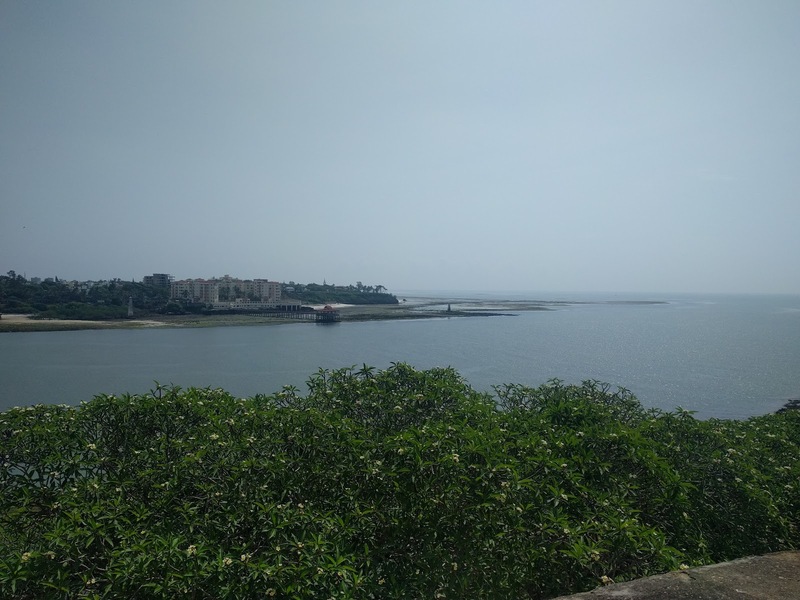 I'm also behind on a few more posts from our Mombasa trip (but I'll just throw in the above view of the Indian Ocean from Fort Jesus here for now). That's all because I was serving as a co-Control Officer for an official visit to Kenya. Every time a U.S. government representative travels on official business abroad, there is someone managing and coordinating the details of the visit. A Control Officer does everything from arranging airport pickup to making hotel reservations to securing important meetings to conducting the orchestra of players involved in making sure the trip is a success - finance offices, multiple modes of transportation, security, notetakers, and more. This experience has completely changed the way I look at how visits by U.S. officials overseas are covered in the news - for every mistake or gaffe, I now know there is at least one cringing, suffering Control Officer! As an entry-level Public Diplomacy Officer (and not a Political Officer), my day-to-day work doesn't include a lot of the activities that most people associate with diplomats: government meetings, reports for Washington, negotiations, etc. The opportunity to be a Control Officer was my first taste of the work that a Political Officer would typically do. Preparation started weeks in advance, with many conference calls with our visitors in DC to make sure we understood their schedules and what they wanted out of their visit. Meanwhile, my co-Control Officer and I worked hard in Nairobi to fill the itineraries with events that addressed their priorities and were logistically feasible. In the end, as a more experienced officer told me, "Every schedule's a draft and everything can be adjusted." Once the trip was under way, I learned that a good Control Officer must be flexible and calm in the face of chaos, as many changes needed to be made on the fly and sometimes at literally a moment's notice. I was very lucky in that the officials whose visit I managed were very kind and low-maintenance. I've heard quite a few horror stories from other diplomats who served as Control Officers for visitors who weren't so enjoyable to support. I was also able to accompany the visitors on many of their engagements, including meetings I never would've attended as part of my regular job here. I can honestly say - despite the long hours and the stress - it was my pleasure to have this opportunity. I look forward to doing it again.